Many say that there is power in numbers and to that end, the power of relationships can’t be underestimated – whether it’s with your business partner, clients or constituents, having a good rapport is as important as having the necessary smarts to identify needs, meet goals and win. In business, a partner can make you or break you. When you find your better corporate half, they will inspire you, challenge you and compliment you. When starting out, how do you go about finding a partner who will be on the same business “page” and yet challenge you to stretch your own capabilities for unmatched entrepreneurial leadership and innovation? I have learned how to embrace, not fear, when people from different backgrounds and expertise emerge. Who would imagine someone with my background as former deputy CFO at the Department of Energy would end up partnering with a larger-than-life, Boston-bred pizza entrepreneur? I met my business partner, Sal Lupoli of Sal’s Pizza and Salvatore’s, through MIT Sloan’s one-year MBA program and we emerged as partners, launching a new disruptive startup called Phoodeez. Shared Values. Before you have a business idea, you and your partner must speak the same language when it comes to values. We’re talking about basic character traits in everyday life – humble beginnings, hard work, loyalty and respect. These are key attributes your future partner should possess. Compliments your skills. Are you the creative force? Find someone analytical who can get your designs off paper and into the hands of hungry customers. Is financially sound. Make sure your partner is able to pull their weight when it comes to cash. Personal debt or owing from a previous business engagement should be red flags. Has the same vision. You should be on the same page regarding launch, expansion and day-to-day strategies. If you aren’t, it’s worth it to reconsider. Periodic goal realignments may be necessary, but if you’re far apart off the bat, it may be time to find another partner. Stays cool under pressure. Starting a new business is always stressful, especially in today’s corporate landscape, so remaining even-keeled is imperative. Ask pointed questions about stressful experiences and consider speaking with past colleagues to understand what it’s like to work with that individual. Mutual Respect: Different experiences and backgrounds shouldn’t be something you fear. 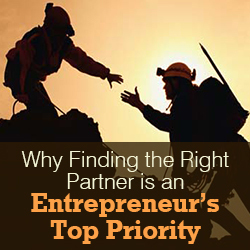 Look for a partner who offers value and a complementarity that fosters respect for what you each bring to the table. Has available resources. Business smarts and a good attitude are pluses, but does your counterpart have other perks at their disposal? Whether it’s infrastructure or a wide networking pool, make sure you’re both ready to contribute above and beyond personal skills. When it comes to nurturing our burgeoning corporate catering concierge company, I provide the financial smarts, identify partners and run the day-to-day operations while Sal has the industry know-how, helped us get off the ground and allowed us to use his restaurants for beta-testing, which enabled us to become profitable within one year of launching in Boston. Sal more than pulled his weight, teaching me about restaurants’ challenges and the pain points we’d have to address to grow our business. And so far, it’s worked amazingly. A good business partner doesn’t just help a business take off – they make you realize it had wings in the first place. The most important thing I learned at MIT, I learned when I met Sal: That it’s possible to make the seemingly impossible happen and that if you’re lucky enough to find the right cofounder, one plus one can equal three. Christine Marcus is the CEO of Phoodeez, a corporate catering concierge startup based in Boston which is disrupting the way companies serve their employees and clients. Christine made the successful transition into entrepreneurship after receiving her MBA at the MIT Sloan School of Management, where she forged a relationship with Sal Lupoli, owner of 50 Sal’s Pizza and Salvatore’s restaurants and co-founder of Phoodeez. It was this partnership that ultimately birthed Phoodeez, as Sal is familiar with the industry’s pain points and Christine has the business and finance know-how. Christine has served previously as the Deputy CFO of the U.S. Department of Energy in Washington, D.C., where among other responsibilities she managed a $28 billion annual budget for advanced energy technologies, basic scientific research and national security programs. She also led cost savings reform in base operations and rebuilt all facets of the department’s financial organization to improve investment analysis, strategic planning, cost projections and financial risks. Before she became Deputy CFO, Christine also served the Department of Energy in other positions. Christine was the team leader for the Office of the Inspector General at the U.S. Department of Commerce in Washington, D.C. from August 2002-January 2006. During this time, she led reviews of the International Trade Administration, briefed senior Department of Commerce and State Department officials led an inspection of the Workers’ Compensation program for the Department of Commerce (leading to an estimated $7+ million in annual savings) and more. Christine earned her B.S. in accounting from the University of Texas at Dallas in 1992 and her MBA from MIT in 2012. She is also a CPA, licensed in Virginia.